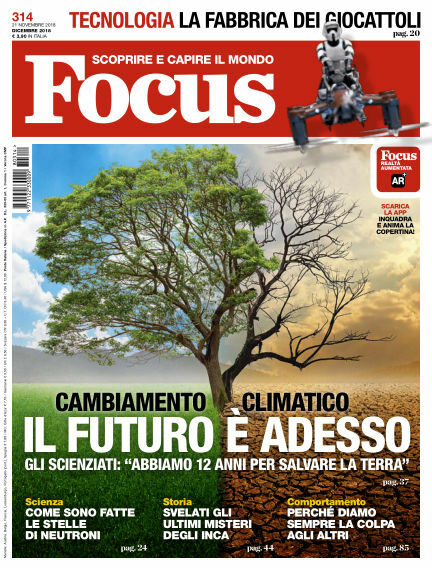 In this issue of Focus Italia : Focus, a popular science magazine, is the most widely read monthly magazine in Italy. It discusses highly interesting and topical issues: technology, science, nature, medicine, behaviour, innovation. It satisfies the curiosity of its loyal readers, appealing to their emotions and interests with spectacular and exclusive images. The clear and direct style appeals to all its target groups. It relies on the contribution of world-renowned scientists, researchers, technicians and experts who enhance the product with highly specific content. The brand is present across various platforms: print, web and social media, TV. Together with advertising partners, it puts together events to engage its audience. With Readly you can read Focus Italia (issue 2018-11-21) and thousands of other magazines on your tablet and smartphone. Get access to all with just one subscription. New releases and back issues – all included.